Authorities have identified two of the 22 people killed in a suicide bombing at an Ariana Grande concert in England. MANCHESTER, England (KTRK) -- Investigators hunted Tuesday for possible accomplices of the suicide bomber who attacked an Ariana Grande concert in Manchester, killing 22 people and sparking a stampede of young concertgoers, some still wearing the American pop star's trademark kitten ears and holding pink balloons. The Islamic State group claimed responsibility for the Monday night carnage, which counted children as young as 8 among its victims and left 59 people wounded. British police raided two sites in the northern English city and arrested a 23-year-old man at a third location. British Prime Minister Theresa May and police said the bomber died in the attack on Manchester Arena - a detail that was not included in the Islamic State claim, which also had discrepancies with the events described by British officials. A top U.S. intelligence official, Dan Coats, said the claim had not been verified by the U.S. government. Manchester police chief Ian Hopkins identified the bombing suspect as 22-year-old Salman Abedi but gave no other details. A European security official, speaking on condition of anonymity because he was not authorized to speak about the ongoing investigation, said Abedi was a Briton of Libyan descent. British election rolls listed him as living at a modest red brick semi-detached house in a mixed suburb of Manchester where police performed a controlled explosion Tuesday afternoon. Natalie Daley, who lived in a nearby home, said she was frightened by a loud bang Tuesday, then police yelling, "Get in your houses - get away from the windows!" 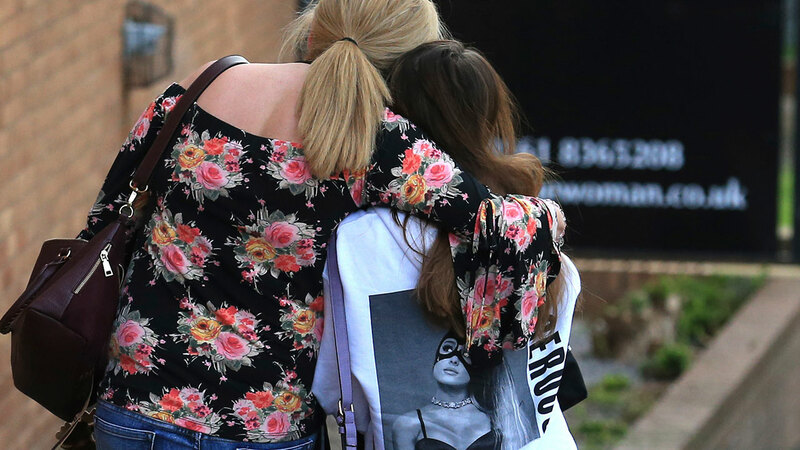 A mother who attended the concert with her daughter describes the explosion aftermath. In attacking the concert, the bomber targeted an audience full of teenagers and 'tweens - Grande fans who call themselves "Arianators." Teenage screams filled the arena just after the explosion Monday night as fans, many clutching pink plastic balloons, scrambled in panic for exits at the 21,000-capacity arena, tumbling over guardrails and each other to escape. The attack sparked a nightlong search for loved-ones - parents for the children they had accompanied or had been waiting to pick up, and friends for each other after groups were scattered by the blast. Twitter and Facebook lit up with heartbreaking appeals for the missing. At least 22 people were killed after an explosion at an Ariana Grande concert. An 8-year-old girl was among the dead - the youngest known victim - and her mother and sister were among the wounded in what May called "a callous terrorist attack." The wounded included 12 children under age 16, hospital officials said. "It was carnage. Everyone was scrambling over each other. ... It was just a race to get out really," said 14-year-old Charlotte Fairclough, who got tickets as a Christmas present. Outside the arena, bleeding victims lay on the pavement. "As we came outside to Victoria Station, there were just people all over the floor covered in blood," said 25-year-old Ryan Molloy. "My partner was helping to try to stem the blood from this one person. ... They were pouring blood from their leg. It was just awful." Eight-year-old Saffie Roussos, the youngest victim identified, was described as "simply a beautiful little girl in every aspect of the word. She was loved by everyone and her warmth and kindness will be remembered fondly," said the head teacher of the Tarleton Community Primary School in Lancashire. Grande's tour has not been canceled or postponed despite reports online, said a person close to the situation, speaking on condition of anonymity because they were not allowed to speak publicly about the topic. The Manchester Arena postponed concerts by the pop group Take That scheduled from Thursday through Saturday.